Extended idling time and the time when the generator set is not operating does not enter into the calculation for load factor. A facility has a generator rated at 550 kW and runs it two hours a week. During those two hours, it runs at 400 kW for 1.5 hours. Find the load factor? This load factor would indicate that the generator could be used as a standby rated generator because it meets the load factor and other criteria of standby as shown in Table-1. Power rating definitions for generator sets are based on typical load factor, hours of use per year, peak demand and application use. 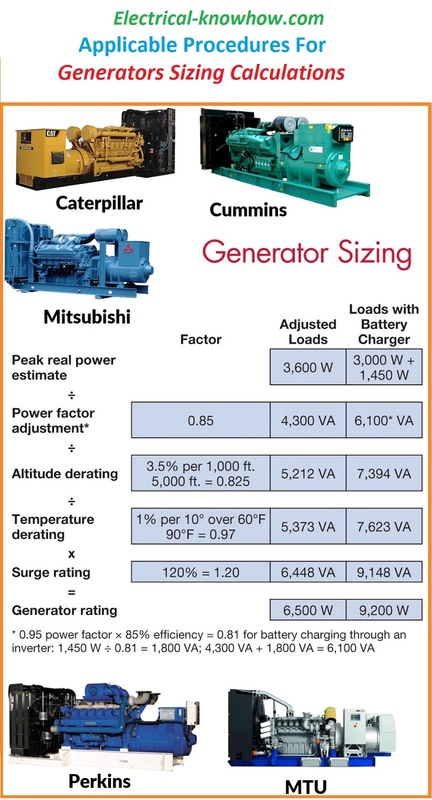 Load factor for different generator power ratings are listed in table-1. The load requirements must be defined as accurately as possible to determine the best size of generator needed. The “maximum demand” or “demand factor” is the highest demand which is placed on the supply within a specified period of time. Another way to describe demand factor is the mathematical ratio of the operating load divided by the connected load. Table-2 shows a range of common demand factors for different apparatus. What is the demand factor of the above system? The 50 hp motor were operated at 100% capacity, its total connected electrical load would be 37.3 kW. However, the 50 hp motor is only expected to produce 54% of its total capacity. Hence, the operating electrical load is 20 Kw. It is very unlikely that individual loads’ maximum demands will coincide at anyone point in time. The maximum demand on the system will always be less than the sum of the maximum demand s of the individual loads. Diversity factor is the mathematical ratio of a system’s individual maximum demands divided by the maximum demand of the system as a whole. Typical diversity factors are shown in Table-3. The connected loads to a generator should be interlocked so that they cannot all be impressed upon the generator set at the same time. If the loads are not interlocked, the generator set rating could be exceeded. Despite this precaution, you must always assume that total time-current characteristics of all motors and other loads starting at the same time will not exceed the generator set rating. A system has individual loads which are connected to three load centers. The load centers have 20 kW, 15 kW and 65 kW loads each, the total connected load of the three load centers is routed to an 80 kW meter. What is the diversity factor of the above system? Total connected load = 20+15+65 =100 kW which will be the Total Max. Demand kW of the system. Noting that the demand factor for theses loads are 80%, 100% and 70% respectively. From the manufacturer catalogs, to meet this load, a generator set rated at a standard size of 750 kVA is needed. From the manufacturer catalogs, a generator set rated at 500 kVA would satisfy the load. Hence, a different diversity factor on the same system will change the total kVA needed. Much smaller chance of asset damage. Now we will start listing the required steps for generator set sizing calculation and we will indicate the common errors done by designers when selecting the right generator set for an application. Also, the required steps will differ according to the type of the installation; new or existing. In the next article, we will start explaining in detail the applicable procedures for Generators Sizing Calculations for Existing Installations. So, please keep following.